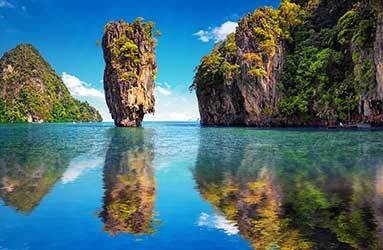 Enjoy an escape to one of the most famous island located in the Gulf of Thailand, the eastern coastline in the southern region. 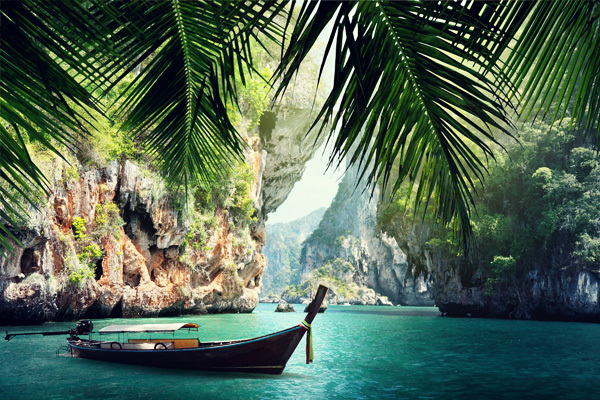 Whether you are looking for a beach getaway on a white sand beach along with crystal clear water, or a wild party famously known as a full-moon party, Samui is your perfect answer. 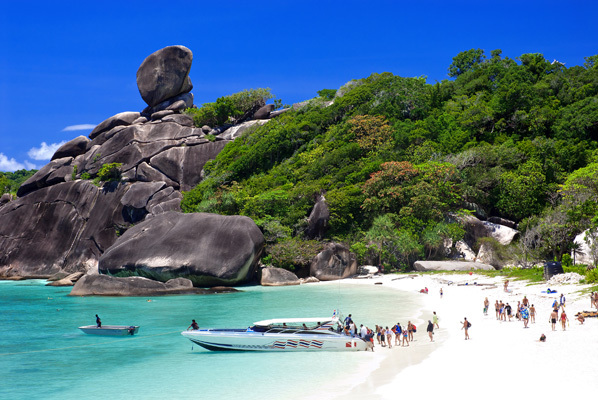 Two of its most famous beaches are Chaweng and Lamai which are particularly the city center. 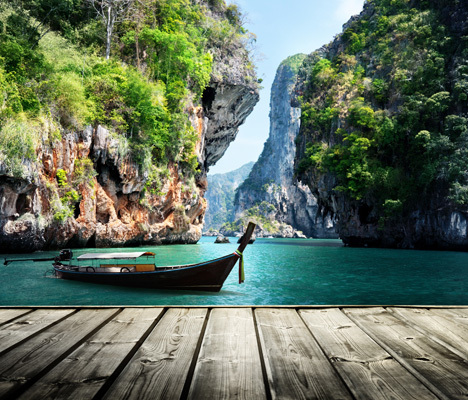 The island has a number of beautiful nature attractions ranging from a plentiful national park (Angthong National Marine Park), splendid waterfall (Na Muang Waterfall), and more. 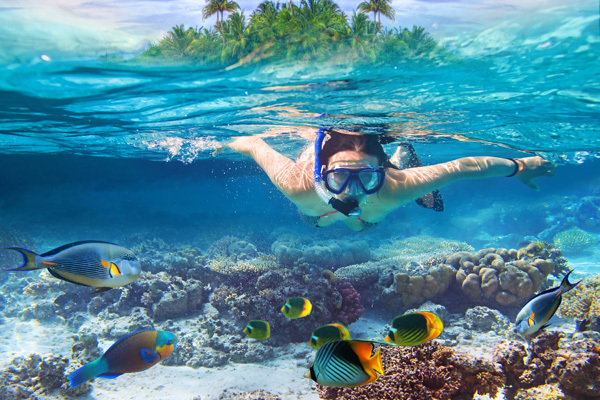 There are ranges of activities you can find in Samuiincluding snorkeling trips or boat trips to the islands nearby such as Koh Tao, Koh Nang Yuan, Koh Pa Ngan. These excursions can be easily booked via us or by hotel (Prices is not inclusive in this package). Pick up from Samui airport. Transfer to hotel. (Lunch and dinner are excluded). Free time at hotel with ABF included. Transfer from hotel to airport Samui. Double room (standard) & breakfasts (Hotels depend on the chosen category : 3 stars / 4 stars). Private car/van/minibus with driver throughout the tour. An epic advanture to western Thailand. 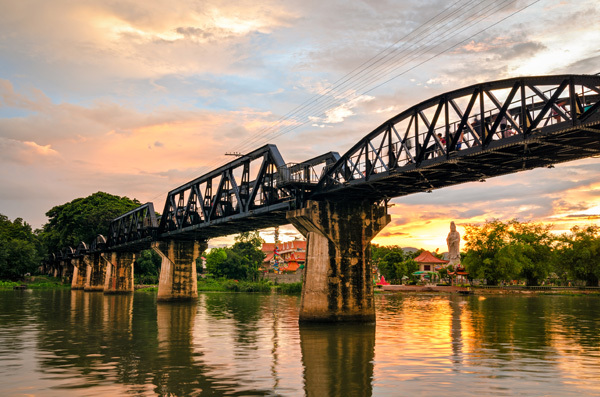 Visit the famous Bridge Over The River Kwai. Boarding on the Death Railway from WW2. Departure from Bangkok to the western region of Kanchanaburi in the middle of rural Thais. Arrival and lunch local food at local restaurant. Visit the War Museum "JEATH" Cemetery of the Allies. The museum has been constructed largely in the form of an Allied Prisoner of War camp. The detention hut with cramped, elevated bamboo bunks contains photographic, pictorial and physical memorabilia dating from the Second World War. 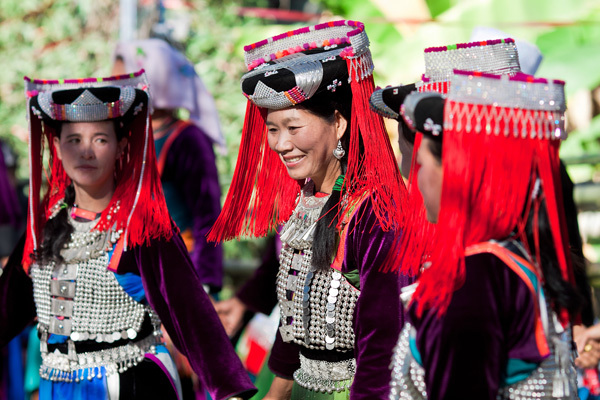 Enjoy the historical stories from our professional tour guide along the trip. 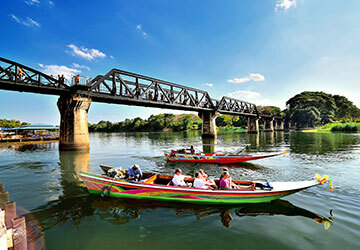 Visit the famous Bridge on the River Kwai. Boarding on the “Thai-Burma Death Railway” a very impressive train that rails are straight into the gorge and spectacular view along the River Kwai. Arrival at hotel for dinner and overnight. Departure from hotel by canoe ride along the river Kwai to Sai Yok Yai Waterfall, cave and Erawan waterfall. 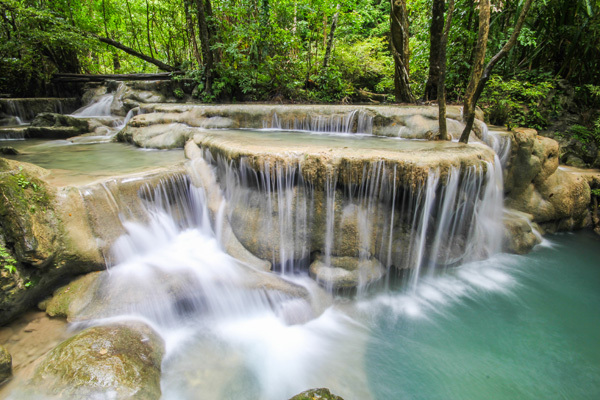 Departure to the Erawan National Park, 550 square-kilometer, 2 sites and containing the famous seven-tiered Erawan waterfall, considered by many as one of the most beautiful waterfalls. Departure from the hotel to stop at Wat Thum Sua. The highlighted of temple is the Giant Buddha on the hill with Thai original style. 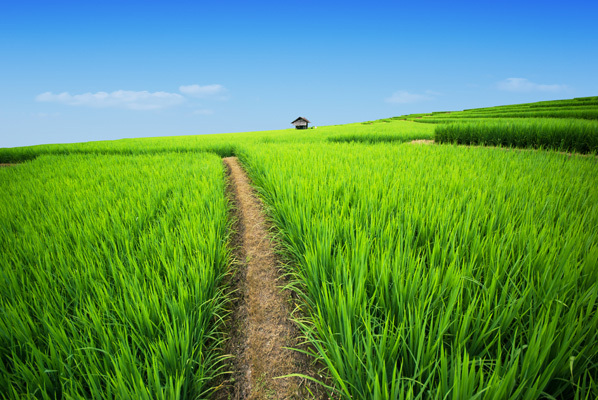 Moreover, this temple has the spectacular architecture is surrounded by green rice fields. Lunch and return to Bangkok. Drop off at Bangkok airport or hotel in Bangkok. 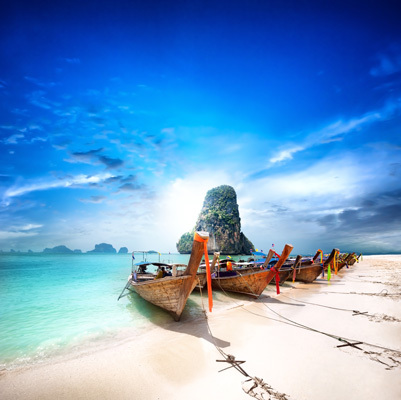 The Sun - The Sand - The Sea are the combination of the Andaman beach of Thailand. 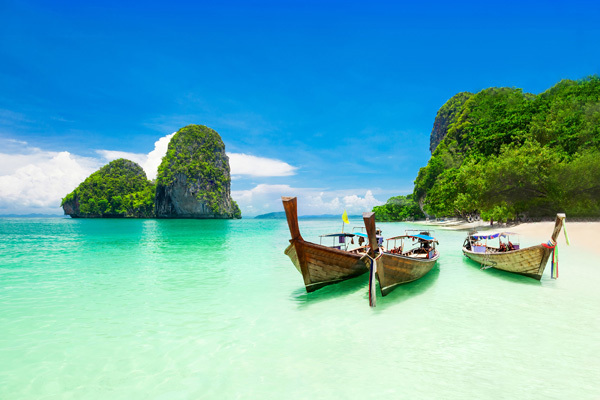 Phuket is the most popular destination for beach vacation. Pick up from Phuket airport. Transfer to hotel. (Lunch and dinner are excluded). Transfer from hotel to airport Phuket. 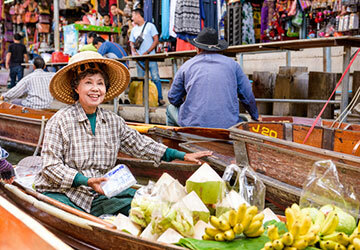 Witness Thailand's famous Damnoen Saduak floatting market where the locals bring exotic fruit to market. Enjoy a trip on a long tail boat through its canals. 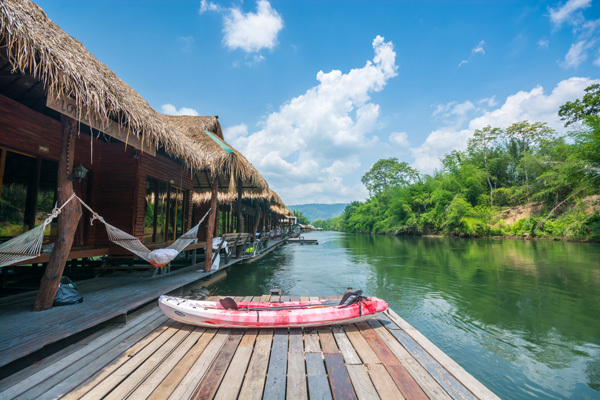 DamnoenSaduak is the most popular and authentic floating market located in Rachaburi province. 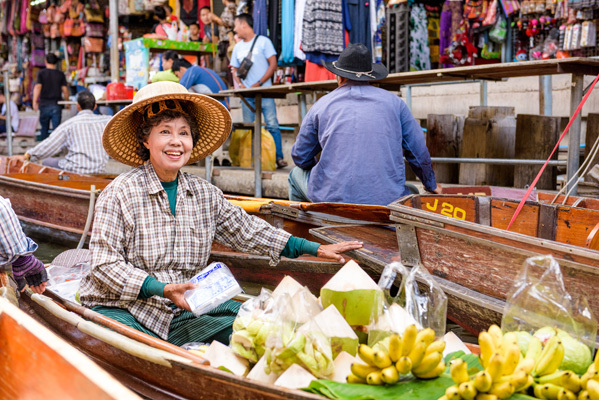 Catch a longtail boat trip in small canal alongside with exotic Thai households doing their morning routine and numbers of boats paddling and selling theirs fresh fruits from their farms and local souvenirs. 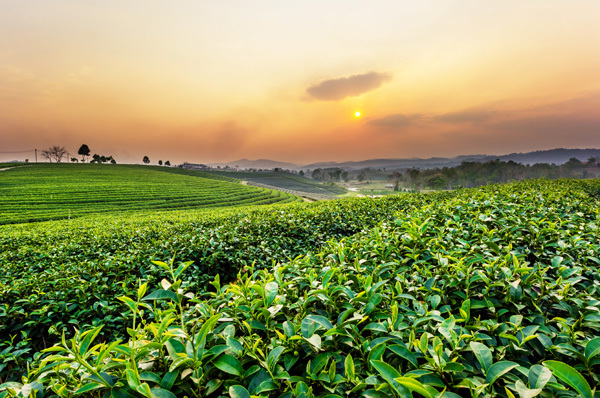 The main draw of this visit is of course trying out Thai dishes and eating local food and also getting a glimpse of the locals’ daily routines. 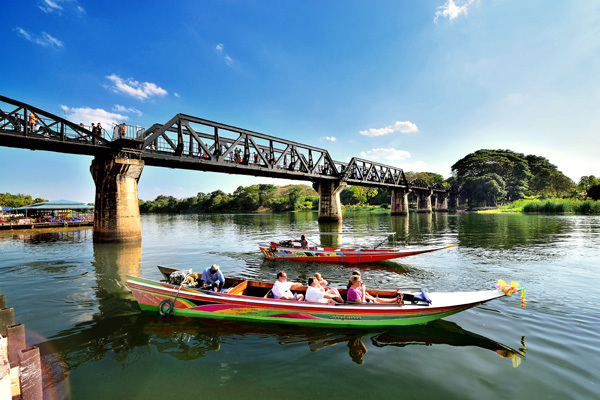 Kanchanaburi, home of the Kwai River, is a popular destination for a relaxing holiday. 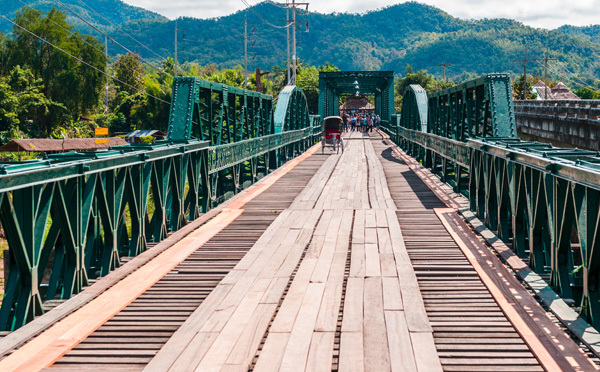 Located in a mountainous area and at a combination of KwaiNoi and KwaiYai Rivers, Kanchanaburi province also full of history and cultural stories lies from WWII memorial. 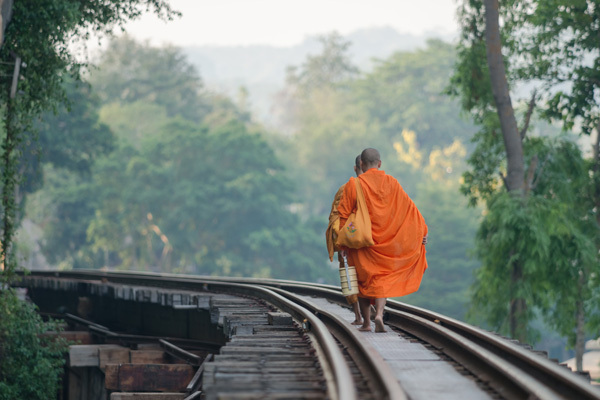 During 20th century, the Japanese used army forces to build a railway from Thailand to Myanmar, because of horrible condition and horrific landscape many of them died during the construction. 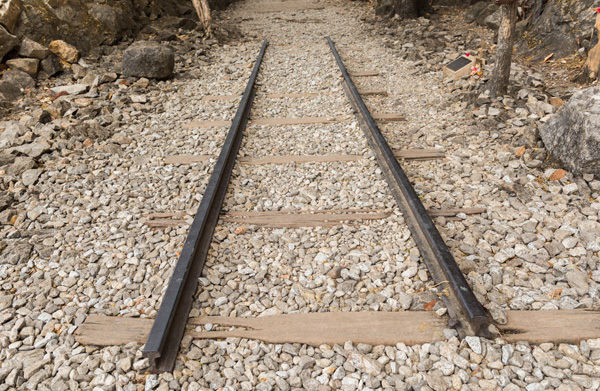 As a result, the railway was named as The Death Railway later on. 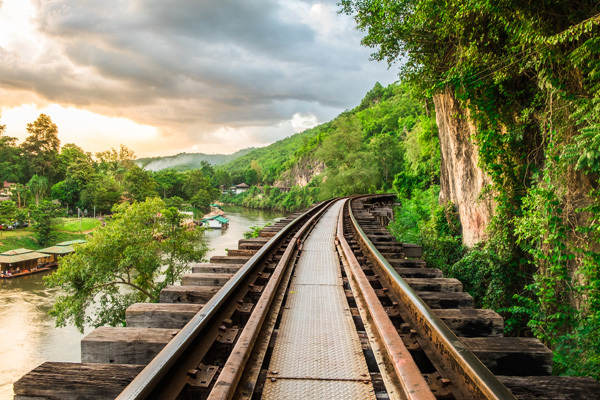 You will get to visit this railway through a fantastic scenery over the impressive river view. SaiYok National Park features numerous mountains, waterfalls and caves including the most famous SaiYokYai Waterfall flowing from a cliff to SaiYokriverand Lawa Caves containing stones formed by nature. 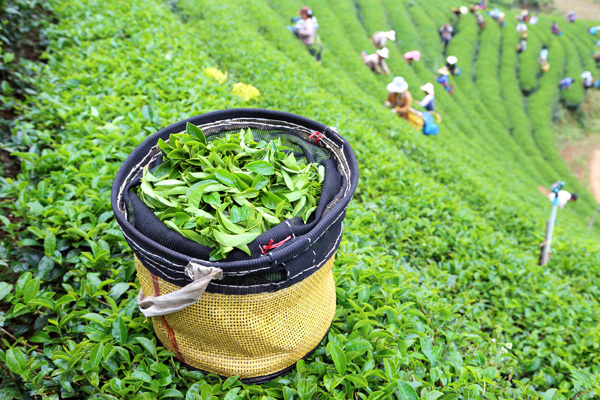 During a trekking, tourists will explore the diversities of natures and plants. Another highlight in the jungle is definitely an elephant trekking and bamboo raftings in the river surrounded by the splendid forests. PathomChedi was built in the reign of King RAMA IX is a very impressive orange chedi located in the center of NakhonPathom province. With is 395feet, it is the world’s highest stupa and the largest pagoda in Thailand. Early departure to visit the popular floating market in Rachaburi known as Damnoen Saduak. Enjoy a long tail boat trip along the canals of Damnoen Saduak. Continues to travel to the western region of Kanchanaburi. 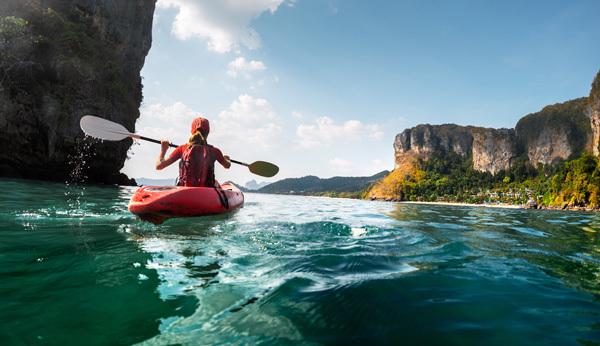 Departure by canoe along the river Kwai to Sai Yok Yai waterfall and Lawa caves. Ride on elephants and down the river by raft. Departure from hotel to Bangkok and shortstop to visit the highest Chedi in Thailand called Pathom Chedi in Nakhon Pathom. Having Lunch at local restaurant and then return back in Bangkok. 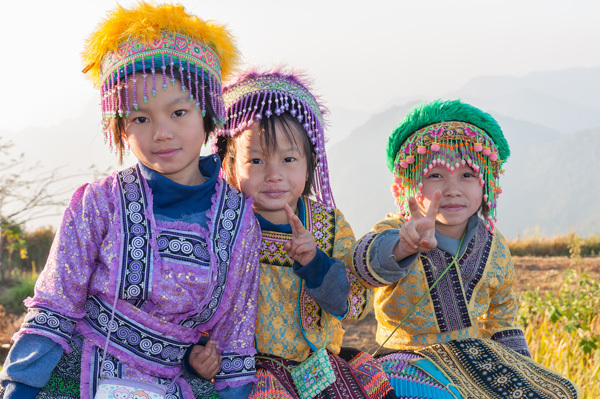 Explore Mae Hong Son province and Pai village known for its charm , fabulous landscapes , stunning mountain view yet remains unknown to the tourists. Mae Hong Sorn , a unique hill tribe village of the northern region of Thailand, is usually known as a “The Valleys Of Three Mist”. Get a ride on an original long-tailed boat along Pai river surrounding by the picturesque mountainous area. 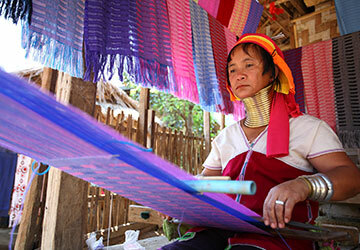 Travel to Burmese border area to visit Karen long neck hill tribe where giraffe women lengthen their necks by wearing numbers of rings around their necks. 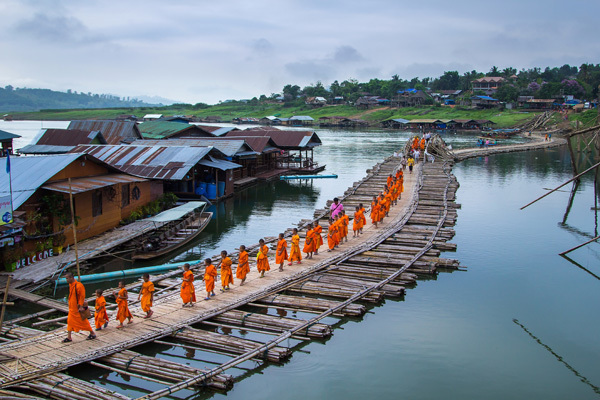 In a small city of Mae Hong Sorn, there are two most famous temples and are also the province’s landmarks that are designed as a mix of Thai and Burmese cultures. Pick up at hotels in Chiang Mai , transfer directly to airport and take domestic flight around 30 minutes from Chiang Mai to Mae Hong Son. 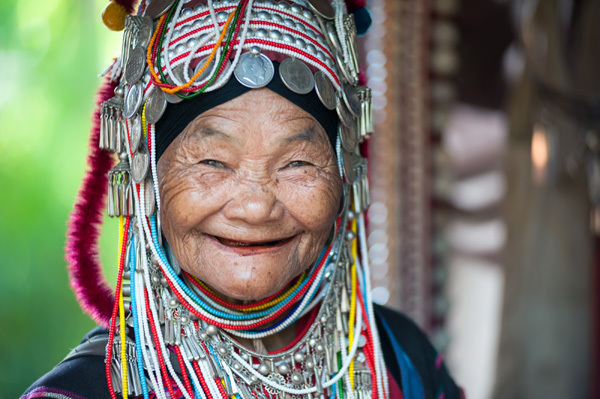 Flight Chiang Mai – Mae Hong Son is included. Pick up at the airport to have local lunch in the restaurant in Mae Hong Son. Visit the landmarks beautiful temples of Mae Hong Son and Mae Hong Son city. Transfer to airport and boarding domestic flight return back to Chiang Mai. 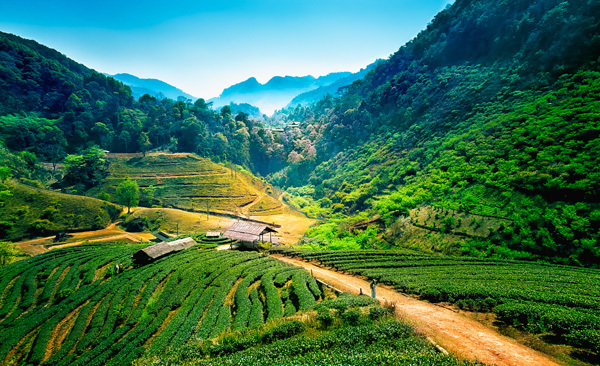 (flight Mae Hong Son – Chiang Mai is included). To maintain everyone's budget, we have not included all the excursions available, they are offered as an option on the spot. In case of non availability of hotels mentioned in your program, we will offer a new list of hotels with same or higher standard. 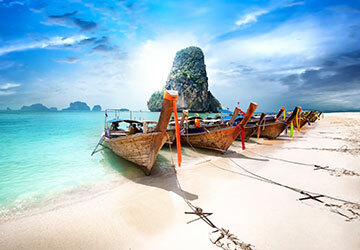 Experience the magical and romantic coastline of Krabi in the south of Thailand. 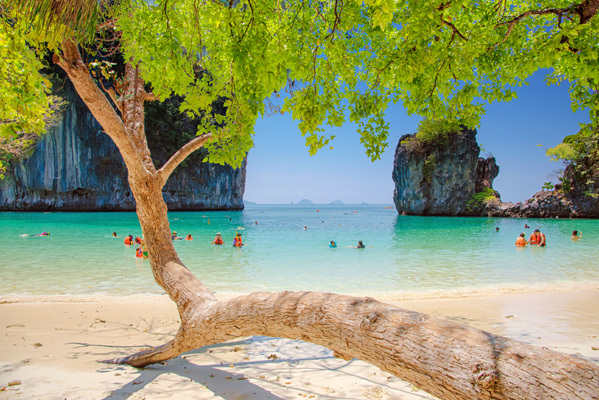 Krabi has more than 100 small islands and is regarded as one of the most popular beach destination in the world. Krabi a seaside city in the south of Thailand known for its stunning beaches , crystal clear water , remarkable views and more than 100 islands.Locates 814 km south of Bangkok in the southern region of Thailand with the area of 4707 sq.km with many places to visit such as Phra Nang Caves , breath taking lagoons , towering cliffs offer many hiking trails. 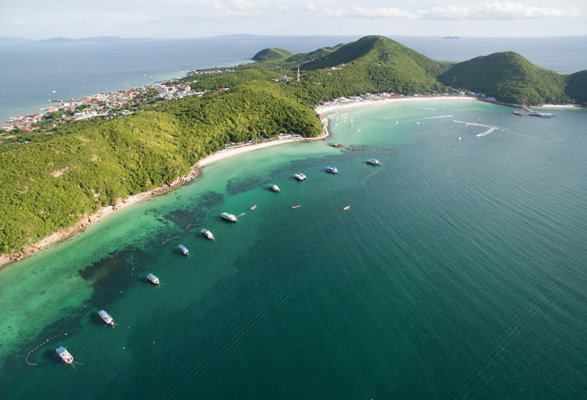 The province is a perfect Andaman sea for snorkeling and diving. 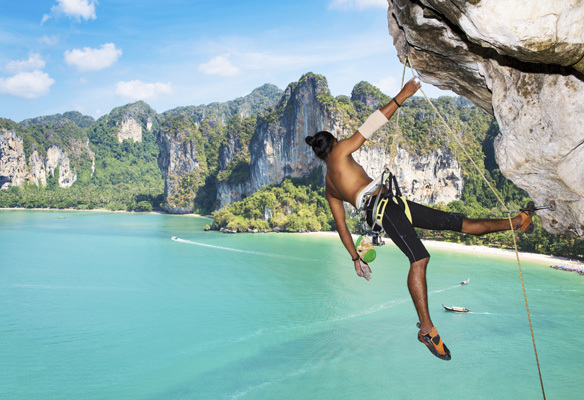 The best time to visit Krabi is between November and April to avoid its monsoon season. Pick up from Krabi airport. Transfer to hotel. (Lunch and dinner are excluded). Transfer from hotel to airport Krabi. Khaoyai National park is regarded as the National Park Heritage of Asian , which covers an area of 2,168 square kilometers. Enjoy a night safari on a 4x4, park tour. KhaoYai National Park, covering 2168 sq.km, it is one of the largest monsoon forest in Asia. Several mountains with peaks up to over 3 km above sea level , intact forest and recognized as the National park heritage in Asia. HaewNarok Waterfall is the most famous waterwall in the national park has 3 levels from 60 m high up to 150 m. This waterfall is 1km from the main road and accessible on foot. The waterfall is located to the south of the national park main office. 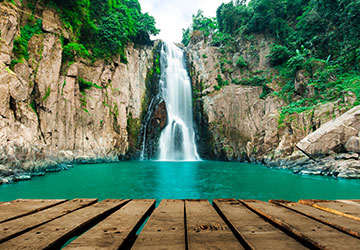 Several waterfalls within the national park area includes Kong KaeoWaterfall ,HaewSuwat Waterfall , Mai Phon Waterfall , HaewSai Waterfall and HaewPrathul Waterfall. Our Khaoyai night safari tour includes travelling on an open-sided truck 4WD with a spotlight into the national park area to see wildlife at its nature. The animals that you will see (depending on the conditions) are monkeys, gibbons, deer,civet and elephants. Pick up from your hotel in Bangkok or Bangkok airport in the morning. Depart for Nakornratchasima (Khaoyai national park) with your tour guide in a passenger van with a driver. 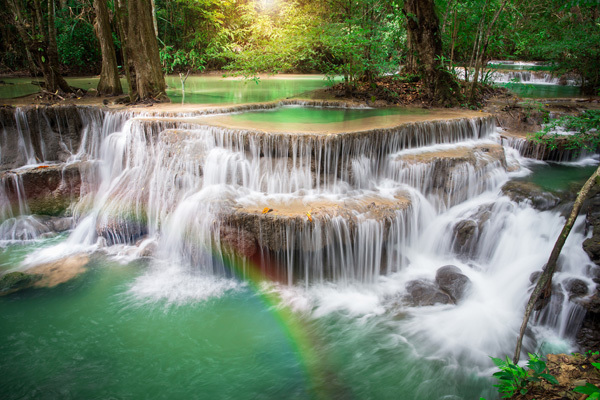 Visit Khaoyai national park and Haew Narok Waterfall (not recommended for clients with disability). Installation at hotel at Khaoyai. After dinner depart for Khaoyai night safari. Return to hotel. Transfer to Bangkok airport or your hotel in Bangkok. Best value package hotel 3 nights + private transfers Bangkok airport - hotel Jomtien beach Pattaya - Bangkok airport. 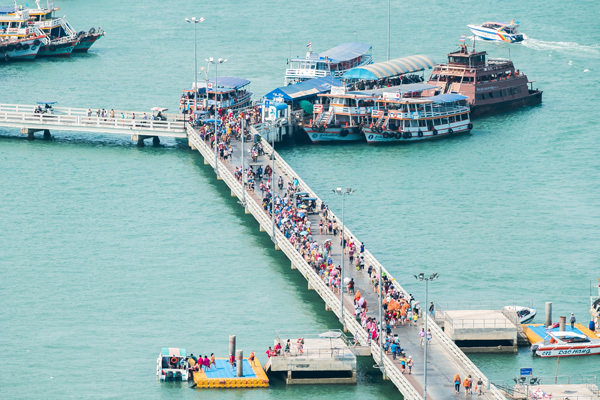 Pattaya, a city located in the area of Chonburi province just 147 km southeast of Bangkok at the east gulf of Thailand (90 minutes drive from Bangkok). 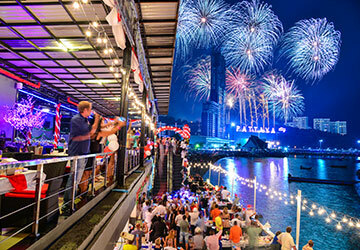 Pattaya is well-known as one of the most popular beach-resort destinations in Thailand with around 30 offshore islands. 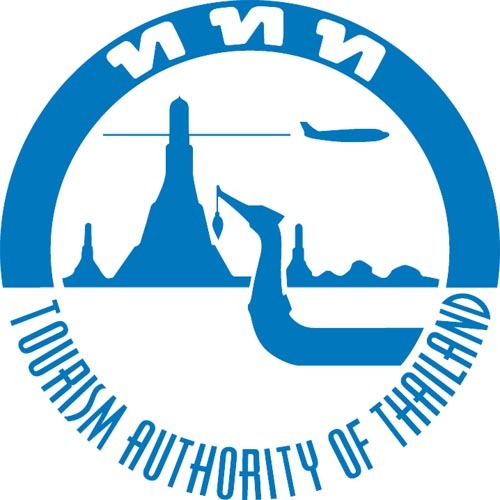 It is regarded as one of the hottest destinations in Thailand ,which attracts more than millions of tourists annually from all over the globe. 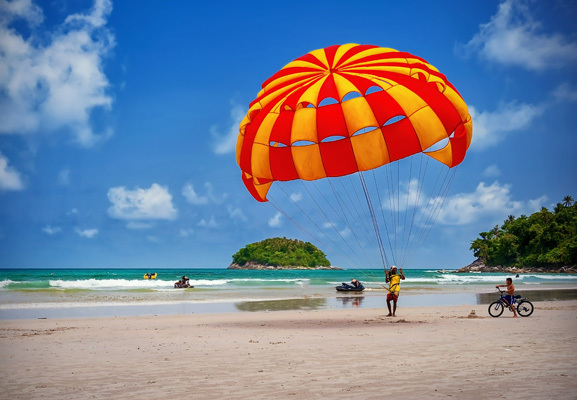 Things to do in Pattaya includes visiting beautiful Jomtien Beach, Na Klua beach, Pattaya beach, Wong Amat beach, Pattaya night market, skydiving ,paintball , Bungee jumping and our recommendation is taking a daytrip to visit the island nearby such as Coral island locally known as KohLan Island. Pick up from a hotel in Bangkok or Bangkok airport in. Transfer to hotel at Pattaya (Jomtien beach). Lunch and dinner are excluded. Transfer from Pattaya to Bangkok.